Nature is often savagely beautiful, as when a leopard stalks a zebra. In the contest between fungi and plants, there are often such beautiful but savage moments. One of the showiest examples takes place in early summer, when spores burst out of cedar trees and soon attack apples, quinces, and serviceberries. The players here are a rust fungus, cedar trees and trees in the Rose family. Rust fungi lead marvelously complex lives. They infect one species of plant, produce spores and then infect a completely different plant. Without these two, often very different, hosts, the fungus is unable to complete its life cycle. We begin our tale with cedar trees (Juniperus virginiana and other cedars). 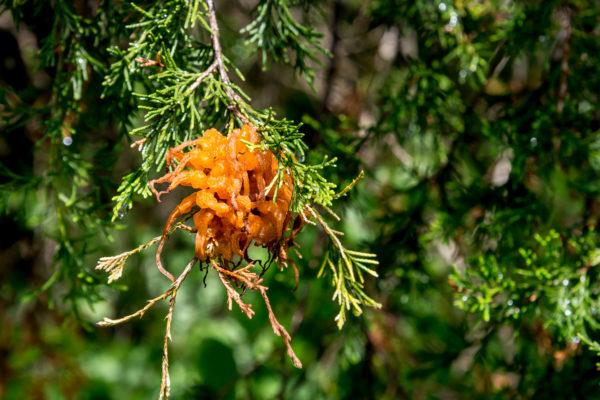 An infected cedar produces impressive, brightly colored, gelatinous, horned structures in late spring. People often observe these - they are hard to miss - and are often concerned about harm to cedar trees. This is the time of year for alarmed posts on social media from people who want to know how to get rid of these odd structures. The answer is - don't. Cedar rusts are harmless to their host, and cause no lasting damage. It is a very different story for the other host, especially apples. 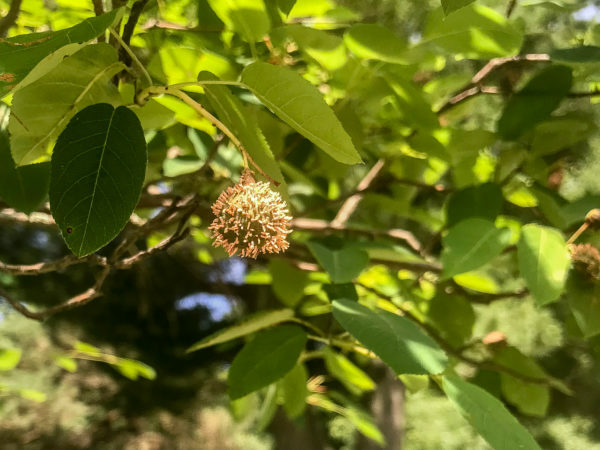 When spores erupt from those beautiful spore horns on cedar, the float on the breeze, a few of them settling on leaves and branches of apple trees, as well as many other trees in the rose family, such as serviceberry. There, the spores germinate, creating spots on leaves and fruit, often rendering the fruit inedible and unsalable. 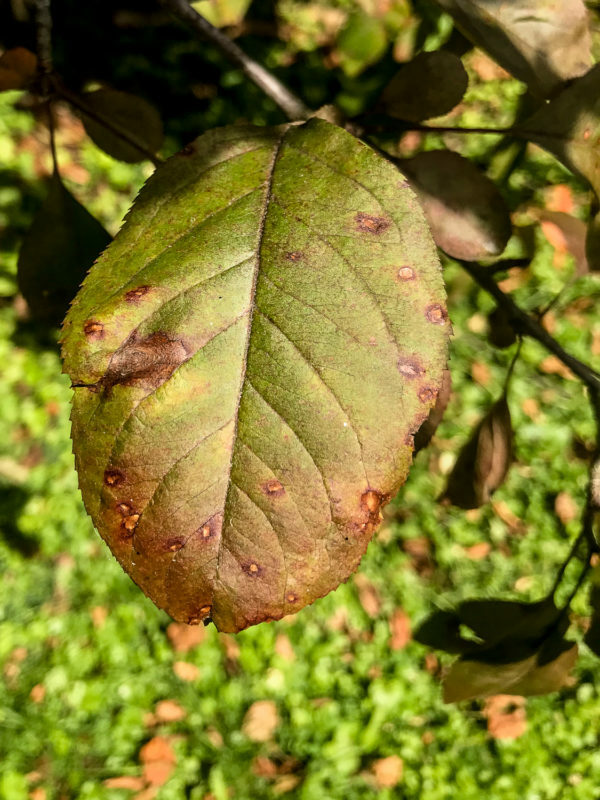 While cedar-apple rust on apples can be treated with fungicide to reduce damage, a better alternative for farmers and home fruit growers is to select rust-resistant varieties. Fortunatey, many nurseries now offer rust-resistant apples and crabapples. For Kentucky growers, the College of Agriculture offers guidance. The story is, of course, more complex. First, there are many species of Gymnosporangium, including cedar-apple rust, cedar-hawthorn rust, cedar-quince rust, and others. Each has the same gymnosperm host, eastern redcedar (Juniperus virginiana), but different angiosperm hosts, including apples, quinces, serviceberry, hawthorn and others. Next time you see these amazing colorful blobs on your cedar trees, enjoy them for their beauty and elegance. Then go buy some resistant apple trees. Note: Some extension services recommend removing eastern redcedars near apple orchards. This is futile, in my opinion. Eastern redcedar is so abundant in Kentucky, and the spores so abundant and able to travel on the wind, that redcedar removal is not effective. Fungicide treatment is expensive and not completely effective. Fortunately, plant breeders have developed a number or resistant apple varieties. So, in Kentucky at least, enjoy your cedars and plant resistant apples. Telial spore horns of cedar-apple rust, Gymnosporangium juniperi-virginianae, on eastern redcedar. Aecial spore horns of Gymnosporangium sp. on serviceberry. Probably G. clavipes, cedar-quince rust. 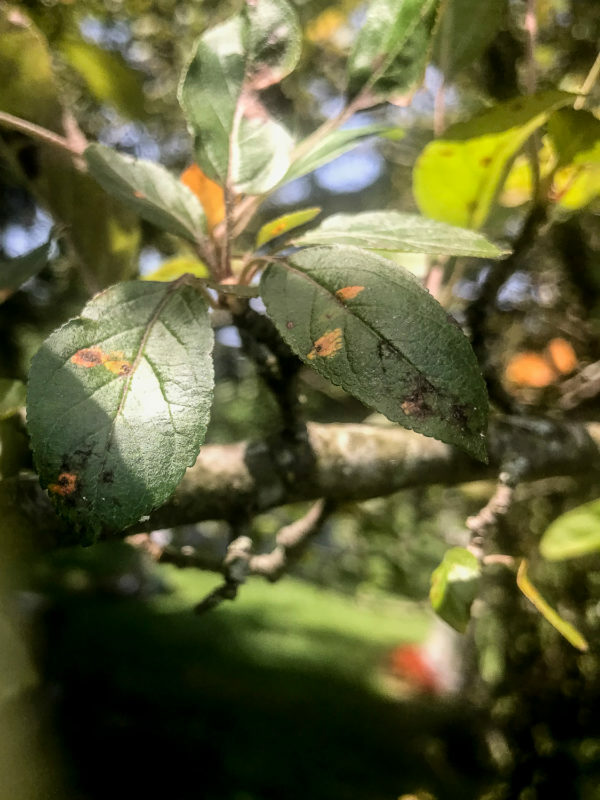 Lesions caused by the aecial stage of cedar-apple rust, on crab apple. Posted in News, Tree Biology and tagged apple, biology, cedar, cedar apple rust, pathology.